This is one of our signature destination shots and a fan favorite! 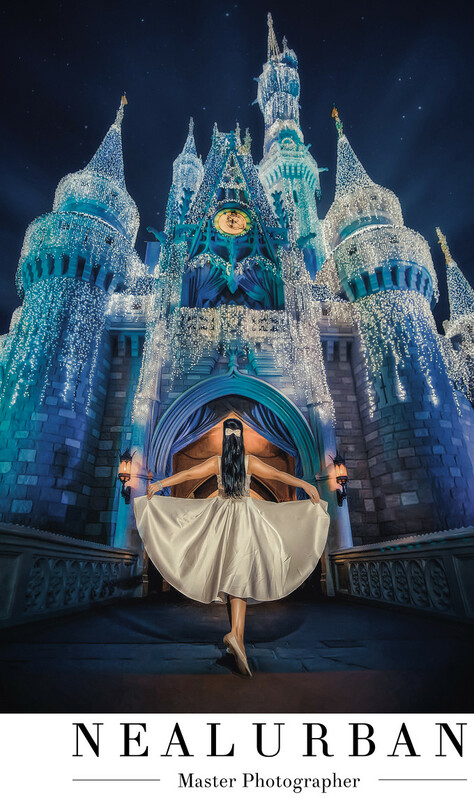 If you want a fairytale, Cinderella's Castle is where you need to be at Disney World in Orlando, Florida! I wish I could say this was an easy task to capture this image of the stunning Vanessa. She is all things Disney! Her actual wedding was back in Buffalo NY, but she flew us out to Orlando for part of their Honeymoon. She really really wanted to have her wedding in Disney, but there is a kicker. You are not allowed to have your own photographer inside the park. You have to use one of their designated photographers. And she was wanted Neal Urban! So here we are! Vanessa and hubby Anthony got us tickets to every Disney Theme Park. She works for Disney, so was able to make that happen. We went to every Park for photos too! Magic Kingdom, Epcot Center, Animal Kingdom, and Hollywood Studios. Then back to Magic Kingdom for this image! This was about 2:00 in the morning. We had after hours passes, so this was great. Attention Disney fans. Having your photos taken in Disney is not easy. We had to pretend we were tourists and bring limited gear. That meant no giant camera bag. Neal had lenses in his cargo pockets and I had more in my purse. Vanessa even had some gear in her Mickey backpack. For lighting, we couldn't bring any tripod stands. We had to use garbage cans or anything we could find to set them on. Vanessa and Anthony are naturals when it comes to being in photos. For this though, we needed just the princess! As you can see, she can pose!! The bride is a dancer, so she needed hardly any direction. This shot could have taken about 5 minutes, if we didn't have to wait for people to walk through. Yes, at 2:00am there were still families with young children out. Everything about this Castle image is stunning. It was when the movie Frozen just came out, so it was decorated like Elsa's Castle. Nothing like taking photos in June, with a winter themed Castle! The colors just pop and are so vibrant in this image. There was no way it could be toned down. It's Disney and everything is bright and colorful. Not to mention Vanessa's gorgeous dress she picked out. She could not bring her wedding gown, as it was just like Cinderella's dress. It was too hard to travel with. This satin dress shown here was perfect. The lighting gave such a great glow and sheen to the dress. With everything else going on in the photo, Vanessa is still center of attention. Vanessa and Anthony were married in April of 2012. This trip was shortly after in June! Location: 1180 Seven Seas Dr. Lake Buena Vista, Florida 32830.